This chili won a competition at my husband’s workplace a few years ago when the employees had a chili cook-off. It is simple to prepare and tastes delicious. 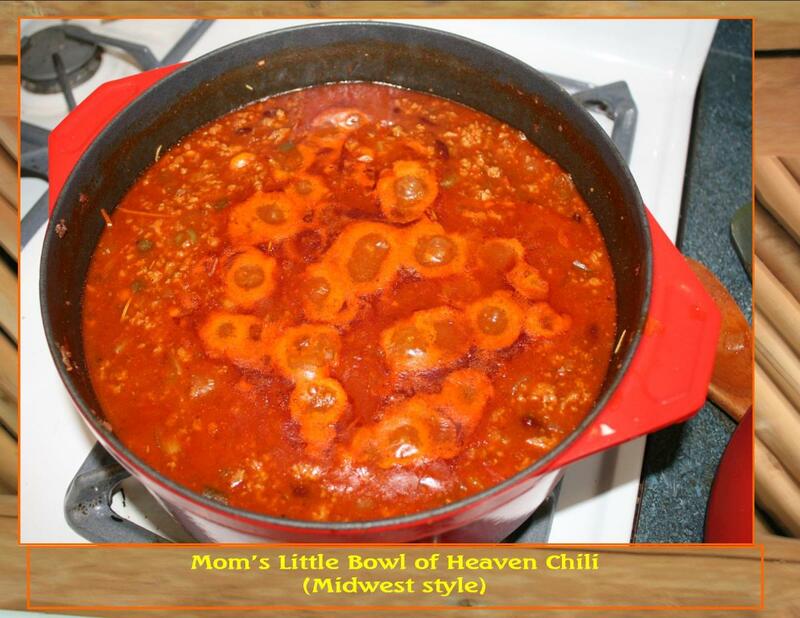 Nothing like a hot bowl of chili on a cold night! ½ cup broth or bouillon that matches the meat you have chosen (such as beef broth with hamburger). 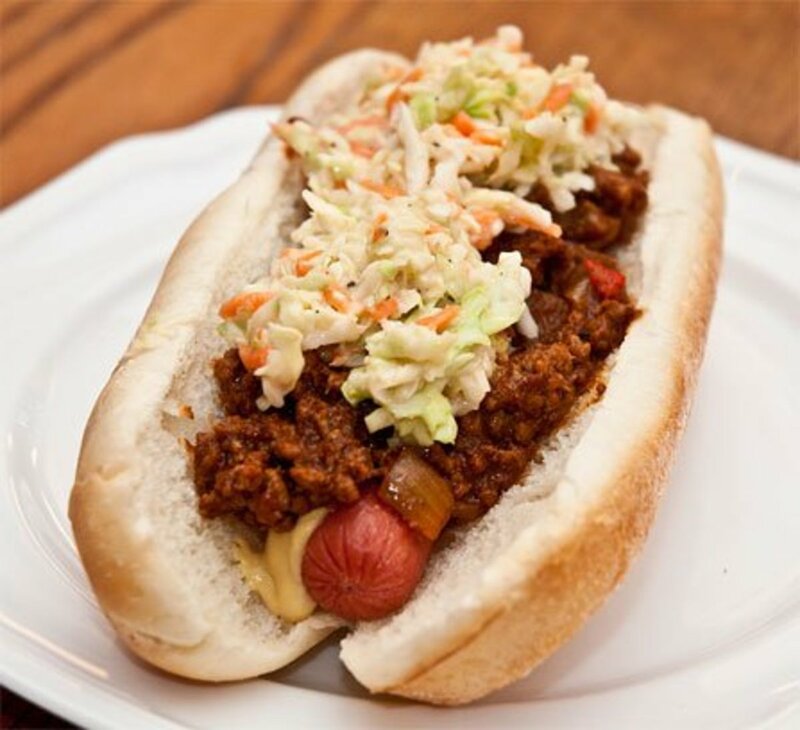 If you don’t like big pieces of tomato in your chili, or you are serving young children or an elderly person who has some difficulty eating and does better with smaller pieces of food, or if you are going to use this for chili dogs, cut the tomatoes into smaller pieces. This is easy to do by running a very sharp knife down through the tomatoes while still in the can. Simply open the can and remove the lid, but before dumping into your pot, run a sharp knife through the tomato pieces, slicing from side to side while using an up and down slicing motion, rotate the can slightly for the next cut and continue until the pieces are chopped up into smaller sections. Or you can chop the pieces up in your hand as you pull them out of the can before throwing them in your pot. Just be careful not to cut yourself! Put your ground meat in a skillet and break it up. Add broth or bouillon. This sounds odd, but it is an old trick I learned at a weight loss group many years ago. Adding the broth will cause the fatty grease in your meat to float on top of the liquid instead of clinging to the meat when you drain it. A bonus is that it keeps the meat from sticking to the pan, making clean up easier. It also enriches the meaty flavor of your ground meat, keeping it juicy and flavorful without the extra fat. 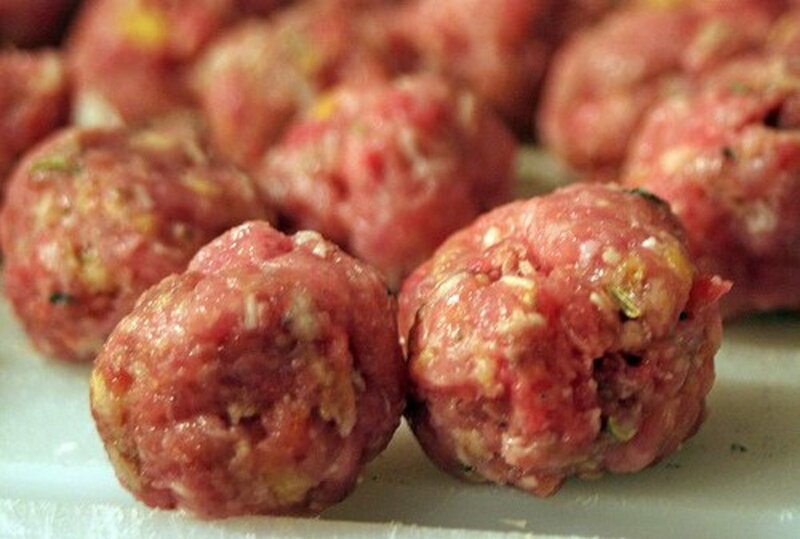 This method of cooking ground meat works for any dish you use ground meat for. Be sure to wash your hands after handling raw meat. Bring meat to a simmer and cook on medium heat until thoroughly cooked. Stir and break the meat up with a spatula so it is small, evenly-sized pieces instead of large lumps. Drain meat and return to pan. If you are going to add onion to your chili, throw it in with the meat now, and fry briefly until the onion softens and browns lightly. You don’t have to use a whole onion if you only want a little onion flavor, just chop up a half or even just a couple of slices of onion. Remember that stewed tomatoes contain some onion, so if you are not a big fan of onions, you can probably get by without adding any additional onion. While the meat is cooking, add the canned ingredients to your large pot. You can use a crock-pot or a big (at least 5 quart) Dutch oven on top of the stove. This is where your 1 – 2 – 3 goes! One can of tomato sauce, two cans of stewed tomatoes (including their liquid), and three cans of chili beans in sauce. If you have never used chili beans in sauce, be sure to check how spicy the sauce listed on the label is. 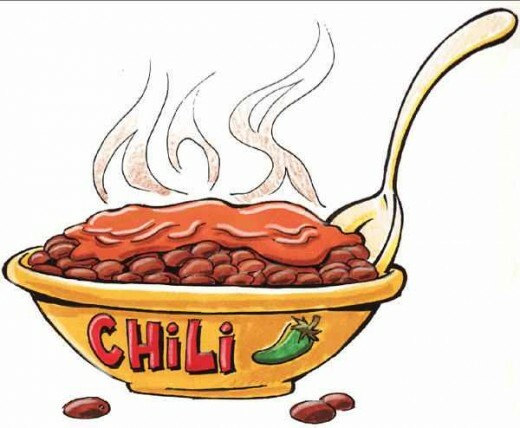 If you use beans with a hot, spicy (rather than mild) sauce, you may end up with chili that is too spicy! I suggest starting with beans in mild sauce, as you can adjust the spiciness of the dish by adding more chili powder or even cayenne pepper, if you like your chili REALLY hot. But if it is too spicy, there isn’t much you can do to make it less hot. So now you have a big pot filled with chili beans in sauce, tomato sauce and stewed tomatoes. Add your cooked, drained ground meat (and onions if you cooked them with your meat). Season with salt, pepper and chili powder. Start with 1 teaspoon of salt and pepper, and 1 tablespoon of chili powder, and let it simmer for a while. Give it a little taste after thirty minutes, and see if you think it needs more flavoring. Remember that with soup and stew-type dishes, the flavors will increase as the dish cooks, so don’t overdo your seasoning early in the process. Simmer for at least one hour. Chili must be cooked or reheated to at least 165 degrees Fahrenheit for safety. Use a metal stem thermometer to ensure 165 degrees F has been reached. This dish will taste better and thicken more the longer you allow it to cook, and it is terrific after several hours on low heat in the crock-pot or in a large pot on the stove top. Stir at least once each hour so it doesn’t stick to the bottom of the pot. Serve in bowls with crackers, or as a topping on hot dogs or burger patties, or in a warmed flour tortilla shell with shredded cheese and lettuce for a quick and easy burrito. Some people like to top a bowl of chili with grated cheese or a dollop of sour cream. It can also be served over rice or spaghetti. My husband prefers his food a lot spicier than I do, so he adds a few drops of hot sauce to his serving. He also likes a spoonful of chili on a poached or fried egg for breakfast. Refrigerate any leftovers. The second day servings are even tastier, as the flavors have time to blend and meld together! It will thicken the longer it cooks or after being refrigerated, so if it is too thick, you can use a small amount of water to thin it to a consistency you prefer. Do you prefer chili without beans? Don't Try This Chili Pepper! It looks like a winner to me too! I will have to go and check my recipe hubs to see if they need some help. I love chilli. My wife makes one, but it's fairly mild, easily spiced up if I want with some hot sauce though. When we had a cook off at work, each of the dozen or more chilli's were so different from each other. It's amazing how different recipes can be. I loved them all.